Length of time with Hyatt Training and date when you started: I’ve been a member at the studio for 3 years now. What were your goals when you started? To increase my core strength and general overall conditioning. What are your goals today? More of the same – I’m feeling really good! What has been your biggest challenge? One leg balancing on the damn bosu! The hardest thing is managing my business activities schedule so as to not miss a session. What have been your biggest areas of improvement? My core strength and balance have definitely improved. I have done a 4 minute low plank! What is your favorite thing about Hyatt Training? I really like the professionalism of Hyatt Training and the whole team’s responsiveness to client’s goals. What is your favorite thing about your personal trainer? Erin is great. She is very professional and knowledgeable and comes well prepared with a carefully thought out series of diverse exercises. 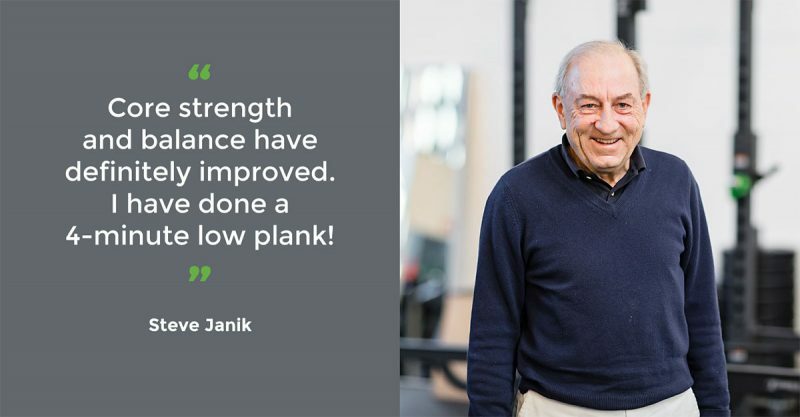 What is your proudest achievement or biggest accomplishment since you began working with Hyatt Training: Being able to comfortably do a 4 minute low plank at 70 years of age. What have you learned: I’ve learned the importance of trusting your trainer. Erin is the best. What advice would you give to other people starting on their fitness journey? Start now, have patience and avoid missing sessions. Consistency really is key! Hyatt Training success stories feature our amazing clients and their inspiring achievements. Here’s a link to more great real-life stories from our clients! If you’d like to participate (or know someone who should), email us at Go@HyattTraining.com.